2013 Wandererer – Mornington MkII. Bas does it again! The players: Leroy, Leigh, Felix, Jig (Greg) and Basil, with a cameo from JD, Steve and Rusty. Venue: Best three rounds from The Dunes, Kingston Heath, St. Andrews Beach, The National (Moonah), The Peninsula (North) and (South). we played at The Dunes in 40-50kmh winds, with shower squalls. My uncle Rusty, cuz Steve and art school mate JD came along for a hit too. Leroy bought himself a nice set of weatherproofs at the Pro Shop prior to tee off. But he soon wished he hadn’t as the club got caught in his sleeve when he hit his first drive and the ball went hard left into the dense grass! I stuffed myself full of painkillers (dodgy back), made a nice practice swing but lifted my head and hit it even worse than Leroy! Awesome. Leroy and I were pretty happy with that, as surely that was an omen that one of us would win the tournament! Felix got off ok and so did my rellies and art school buddy (despite his weird hands-the-wrong-way grip). Today was the first day for the late arrivals Greg and Basil who also had their Dad (John) as a trusty caddie for the round. Sunshine and light winds greeted us on the course. Everyone was excited about playing the No.2 course in Australia. Friendly Pro shop put us in the right frame of mind. Basil and Greg played in the first group with Leigh, Leroy and Felix to follow. The course provided some great highlights with Greg smashing his drives up the fast running fairways between many treacherous fairway bunkers. Alistair Mackenzie’s bunkering was brilliant. Basil managed to hit 11 out of 14 fairways to set himself up for a 2 over handicap score. The only hole he really struggled with was the Par 3 15th where he took three shots to get out of the greenside bunker after his ball buried into the sand. Day 4 St . Andrews Beach. 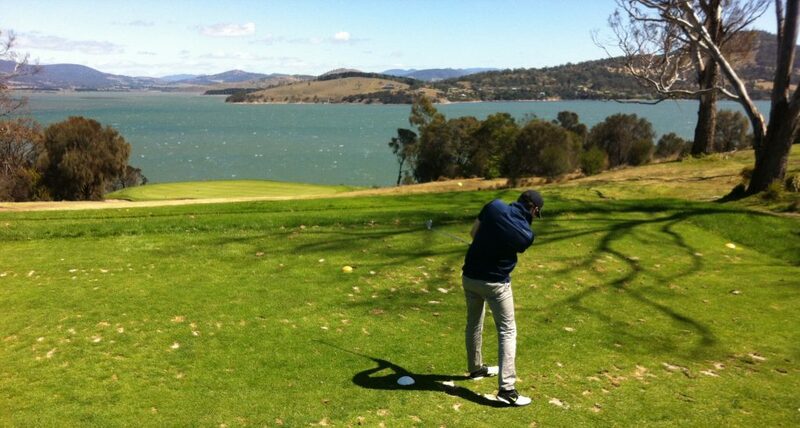 Fantastic sunny day with light winds on a great course in superb condition. Basil and Greg played in the first group and we had golf carts. Highlights included Greg and Felix landing onto the Par 4 2nd hole with their drives only to walk off with a par. Greg had a tap in birdie after a superb 8 iron into the par 3 12th. Basil nailed a ten metre putt for birdie on the par 4, 15th. Greg and Bas struggled all day with their irons and Greg took 3 shots to get out of one of the fairway bunkers and many drives into the rough. A frustrating day in perfect weather conditions. Greg beat Bas by one shot off the stick. – Cravo cracked the shits and threw his club helicopter style about 50m down the fairway! Rain and lightning 5 mins after finishing. Due to the forecast we headed to the course early to see if we could get an earlier tee time, it certainly paid off finishing just before the storm hit. Players were Felix, Leigh, Lewah and Basil- the first day to play together as a group. Needless to say with the crazy wind it was a testing day on this amazing course. A grade presentation and layout to boot. Rolling open dune country with some steep approaches to some treacherous contoured greens with awesome bunkering. The best course on the tour so far. Highlights included Felix hitting the 9th hole, Par 4 in one and finishing with par, Leroy carving up some of the Par 5’s with some successive great shots to get par. Leigh hitting 2 of the Par 3’s in regulation. Bas hitting the greenside bunker for 2 on one of the Par 5’s and just missing his birdie. Most frustrating shot for Bas was hitting 2 duff shots in a row and losing his first golf ball on the Par 5, 15th. Just to step it up we finished the tournie with 2 rounds on the last day with carts. The weather was cloudy with stong and gusty 40km/h winds. The course was in great condition and the North course provided plenty of superb holes. It was tight with lots of trees and scrub off the fairways. Basil and Felix pulled the pin after 27 holes after declaring themselves golf poisoned and played ambrose for the last 9. Lewah made a late charge on the last 18 and if it was not for a 10 on one of the Par 4’s due to a very deep bunker that would not let his ball out he may have been in a playoff with Basil. Leroy scored the only birdie of the day with a cracking drive followed by a great wedge and then drained the putt on one of the short par 4’s. Other highlights included some cranking drives by Felix to set up par and a great iron shot by Leroy into the Long 18th hole (North) to set up a Par. Leigh was the most consistent player in the tounie always shooting between 8 and 10 over except for one round. Final round Scores Leigh +17 and +9, Lewah +11 and +9, Felix +15, Bas +7. Congrats to Basil, winner by 6 shots from Lwah, 8 from Felix and 9 from me. Posted on April 25, 2017 April 25, 2017 by Gentlepersons' World Golf Tour, Tasmania	This entry was posted in Uncategorized. Bookmark the permalink.